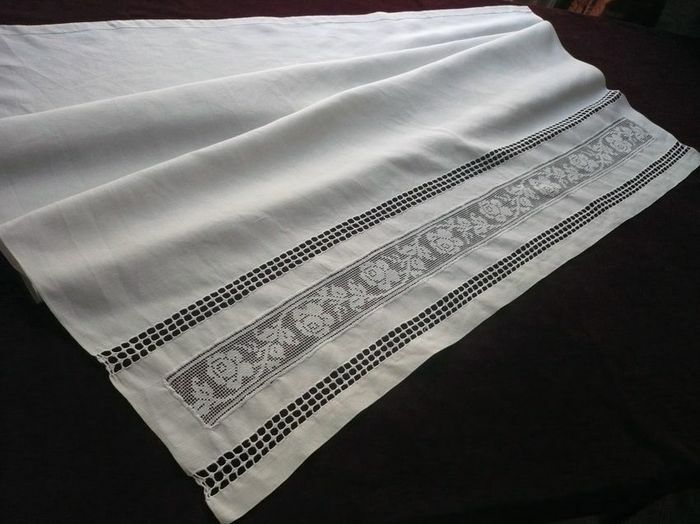 A perfectly charming infant sheet loomed of a beautiful quality of ecru "fil de lin" linen. This darling sheet has an inset band of hand-made filet lace with a pretty floral motif that runs the length of the return as well as two openwork rows of reticello embroidery on either side of the insert band. The linen is of a medium weight, tightly loomed and with a sensual drape. Hemmed by hand with miniscule stitches. Early 20th c. Impeccable condition. Dimensions: 45 x 40.5in.